ON THE evening of August 22nd 1991—16 years ago this week—Alexei Kondaurov, a KGB general, stood by the darkened window of his Moscow office and watched a jubilant crowd moving towards the KGB headquarters in Lubyanka Square. A coup against Mikhail Gorbachev had just been defeated. The head of the KGB who had helped to orchestrate it had been arrested, and Mr Kondaurov was now one of the most senior officers left in the fast-emptying building. For a moment the thronged masses seemed to be heading straight towards him. Those feelings of betrayal and humiliation were shared by 500,000 KGB operatives across Russia and beyond, including Vladimir Putin, whose resignation as a lieutenant-colonel in the service had been accepted only the day before. Eight years later, though, the KGB men seemed poised for revenge. Just before he became president, Mr Putin told his ex-colleagues at the Federal Security Service (FSB), the KGB’s successor, “A group of FSB operatives, dispatched under cover to work in the government of the Russian federation, is successfully fulfilling its task.” He was only half joking. By many indicators, today’s security bosses enjoy a combination of power and money without precedent in Russia’s history. The Soviet KGB and its pre-revolutionary ancestors did not care much about money; power was what mattered. Influential though it was, the KGB was a “combat division” of the Communist Party, and subordinate to it. As an outfit that was part intelligence organisation, part security agency and part secret political police, it was often better informed, but it could not act on its own authority; it could only make “recommendations”. In the 1970s and 1980s it was not even allowed to spy on the party bosses and had to act within Soviet laws, however inhuman. The KGB provided a crucial service of surveillance and suppression; it was a state within a state. Now, however, it has become the state itself. Apart from Mr Putin, “There is nobody today who can say no to the FSB,” says Mr Kondaurov. All important decisions in Russia, says Ms Kryshtanovskaya, are now taken by a tiny group of men who served alongside Mr Putin in the KGB and who come from his home town of St Petersburg. In the next few months this coterie may well decide the outcome of next year’s presidential election. But whoever succeeds Mr Putin, real power is likely to remain in the organisation. Of all the Soviet institutions, the KGB withstood Russia’s transformation to capitalism best and emerged strongest. “Communist ideology has gone, but the methods and psychology of its secret police have remained,” says Mr Kondaurov, who is now a member of parliament. Mr Putin’s ascent to the presidency of Russia was the result of a chain of events that started at least a quarter of a century earlier, when Yuri Andropov, a former head of the KGB, succeeded Leonid Brezhnev as general secretary of the Communist Party. Andropov’s attempts to reform the stagnating Soviet economy in order to preserve the Soviet Union and its political system have served as a model for Mr Putin. Early in his presidency Mr Putin unveiled a plaque at the Lubyanka headquarters that paid tribute to Andropov as an “outstanding political figure”. Staffed by highly educated, pragmatic men recruited in the 1960s and 1970s, the KGB was well aware of the dire state of the Soviet economy and the antique state of the party bosses. It was therefore one of the main forces behind perestroika, the loose policy of restructuring started by Mr Gorbachev in the 1980s. Perestroika’s reforms were meant to give the Soviet Union a new lease of life. When they threatened its existence, the KGB mounted a coup against Mr Gorbachev. Ironically, this precipitated the Soviet collapse. The defeat of the coup gave Russia an historic chance to liquidate the organisation. “If either Gorbachev or Yeltsin had been bold enough to dismantle the KGB during the autumn of 1991, he would have met little resistance,” wrote Yevgenia Albats, a journalist who has courageously covered the grimmest chapters in the KGB’s history. Instead, both Mr Gorbachev and Yeltsin tried to reform it. The “blue blood” of the KGB—the First Chief Directorate, in charge of espionage—was spun off into a separate intelligence service. The rest of the agency was broken into several parts. Then, after a few short months of talk about openness, the doors of the agency slammed shut again and the man charged with trying to reform it, Vadim Bakatin, was ejected. His glum conclusion, delivered at a conference in 1993, was that although the myth about the KGB’s invincibility had collapsed, the agency itself was very much alive. Yet Mr Yeltsin, though he let the agency survive, did not use it as his power base. In fact, the KGB was cut off from the post-Soviet redistribution of assets. 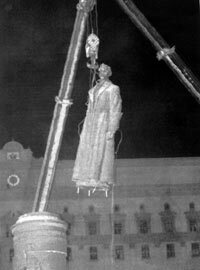 Worse still, it was upstaged and outwitted by a tiny group of opportunists, many of them Jews (not a people beloved by the KGB), who became known as the oligarchs. Between them, they grabbed most of the country’s natural resources and other privatised assets. KGB officers watched the oligarchs get super-rich while they stayed cash-strapped and sometimes even unpaid. Some officers did well enough, but only by offering their services to the oligarchs. To protect themselves from rampant crime and racketeering, the oligarchs tried to privatise parts of the KGB. Their large and costly security departments were staffed and run by ex-KGB officers. They also hired senior agency men as “consultants”. Fillip Bobkov, the head of the Fifth Directorate (which dealt with dissidents), worked for a media magnate, Vladimir Gusinsky. Mr Kondaurov, a former spokesman for the KGB, worked for Mikhail Khodorkovsky, who ran and largely owned Yukos. “People who stayed in the FSB were B-list,” says Mark Galeotti, a British analyst of the Russian special services. In the 1990s we had one objective: to survive and preserve our skills. We did not consider ourselves to be separate from those who stayed in the FSB. We shared everything with them and we saw our work as just another form of serving the interests of the state. We knew that there would come a moment when we would be called upon. That moment came on New Year’s Eve 1999, when Mr Yeltsin resigned and, despite his views about the KGB, handed over the reins of power to Mr Putin, the man he had put in charge of the FSB in 1998 and made prime minister a year later. As the new president saw things, his first task was to restore the management of the country, consolidate political power and neutralise alternative sources of influence: oligarchs, regional governors, the media, parliament, opposition parties and non-governmental organisations. His KGB buddies helped him with the task. The most politically active oligarchs, Mr Berezovsky, who had helped Mr Putin come to power, and Mr Gusinsky, were pushed out of the country, and their television channels were taken back into state hands. Mr Khodorkovsky, Russia’s richest man, was more stubborn. Despite several warnings, he continued to support opposition parties and NGOs and refused to leave Russia. In 2003 the FSB arrested him and, after a show trial, helped put him in jail. All the strategic decisions, according to Ms Kryshtanovskaya, were and still are made by the small group of people who have formed Mr Putin’s informal politburo. They include two deputy heads of the presidential administration: Igor Sechin, who officially controls the flow of documents but also oversees economic matters, and Viktor Ivanov, responsible for personnel in the Kremlin and beyond. Then come Nikolai Patrushev, the head of the FSB, and Sergei Ivanov, a former defence minister and now the first deputy prime minister. All are from St Petersburg, and all served in intelligence or counter-intelligence. Mr Sechin is the only one who does not advertise his background. That two of the most influential men, Mr Sechin and Viktor Ivanov, hold only fairly modest posts (each is a deputy head) and seldom appear in public is misleading. It was, after all, common Soviet practice to have a deputy, often linked to the KGB, who carried more weight than his notional boss. “These people feel more comfortable when they are in the shadows,” explains Ms Kryshtanovskaya. In any event, each of these KGB veterans has a plethora of followers in other state institutions. One of Mr Patrushev’s former deputies, also from the KGB, is the minister of the interior, in charge of the police. Sergei Ivanov still commands authority within the army’s headquarters. Mr Sechin has close family ties to the minister of justice. The prosecution service, which in Soviet times at least nominally controlled the KGB’s work, has now become its instrument, along with the tax police. The political clout of these siloviki is backed by (or has resulted in) state companies with enormous financial resources. Mr Sechin, for example, is the chairman of Rosneft, Russia’s largest state-run oil company. Viktor Ivanov heads the board of directors of Almaz-Antei, the country’s main producer of air-defence rockets, and of Aeroflot, the national airline. Sergei Ivanov oversees the military-industrial complex and is in charge of the newly created aircraft-industry monopoly. But the siloviki reach farther, into all areas of Russian life. They can be found not just in the law-enforcement agencies but in the ministries of economy, transport, natural resources, telecoms and culture. Several KGB veterans occupy senior management posts in Gazprom, Russia’s biggest company, and its pocket bank, Gazprombank (whose vice-president is the 26-year-old son of Sergei Ivanov). 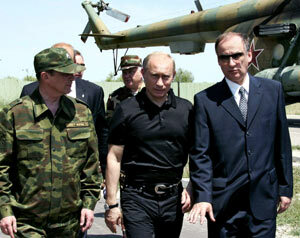 Alexei Gromov, Mr Putin’s trusted press secretary, sits on the board of Channel One, Russia’s main television channel. The railway monopoly is headed by Vladimir Yakunin, a former diplomat who served his country at the United Nations in New York and is believed to have held a high rank in the KGB. Sergei Chemezov, Mr Putin’s old KGB friend from his days in Dresden (where the president worked from 1985 to 1990), is in charge of Rosoboronexport, a state arms agency that has grown on his watch into a vast conglomerate. The list goes on. Many officers of the active reserve have been seconded to Russia’s big companies, both private and state-controlled, where they draw a salary while also remaining on the FSB payroll. “We must make sure that companies don’t make decisions that are not in the interest of the state,” one current FSB colonel explains. Being an active-reserve officer in a firm is, says another KGB veteran, a dream job: “You get a huge salary and you get to keep your FSB card.” One such active-reserve officer is the 26-year-old son of Mr Patrushev who was last year seconded from the FSB to Rosneft, where he is now advising Mr Sechin. (After seven months at Rosneft, Mr Putin awarded Andrei Patrushev the Order of Honour, citing his professional successes and “many years of conscientious work”.) Rosneft was the main recipient of Yukos’s assets after the firm was destroyed. The attack on Yukos, which entered its decisive stage just as Mr Sechin was appointed to Rosneft, was the first and most blatant example of property redistribution towards the siloviki, but not the only one. Mikhail Gutseriev, the owner of Russneft, a fast-growing oil company, was this month forced to give up his business after being accused of illegal activities. For a time, he had refused; but, as he explained, “they tightened the screws” and one state agency after another—the general prosecutor’s office, the tax police, the interior ministry—began conducting checks on him. The transfer of financial wealth from the oligarchs to the siloviki was perhaps inevitable. It certainly met with no objection from most Russians, who have little sympathy for “robber barons”. It even earned the siloviki a certain popularity. But whether they will make a success of managing their newly acquired assets is doubtful. “They know how to break up a company or to confiscate something. But they don’t know how to manage a business. They use force simply because they don’t know any other method,” says an ex-KGB spook who now works in business. Curiously, the concentration of such power and economic resources in the hands of a small group of siloviki, who identify themselves with the state, has not alienated people in the lower ranks of the security services. There is trickle-down of a sort: the salary of an average FSB operative has gone up several times over the past decade, and a bit of freelancing is tolerated. Besides, many Russians inside and outside the ranks believe that the transfer of assets from private hands to the siloviki is in the interests of the state. “They are getting their own back and they have the right to do so,” says Mr Goloshchapov. The rights of the siloviki, however, have nothing to do with the formal kind that are spelled out in laws or in the constitution. What they are claiming is a special mission to restore the power of the state, save Russia from disintegration and frustrate the enemies that might weaken it. Such idealistic sentiments, says Mr Kondaurov, coexist with an opportunistic and cynical eagerness to seize the situation for personal or institutional gain. The security servicemen present themselves as a tight brotherhood entitled to break any laws for the sake of their mission. Their high language is laced with profanity, and their nationalism is often combined with contempt for ordinary people. They are, however, loyal to each other. Competition to enter the service is intense. The KGB picked its recruits carefully. Drawn from various institutes and universities, they then went to special KGB schools. Today the FSB Academy in Moscow attracts the children of senior siloviki; a vast new building will double its size. The point, says Mr Galeotti, the British analyst, “is not just what you learn, but who you meet there”. Graduates of the FSB Academy may well agree. “A Chekist is a breed,” says a former FSB general. A good KGB heritage—a father or grandfather, say, who worked for the service—is highly valued by today’s siloviki. Marriages between siloviki clans are also encouraged. Viktor Cherkesov, the head of Russia’s drug-control agency, who was still hunting dissidents in the late 1980s, has summed up the FSB psychology in an article that has become the manifesto of the siloviki and a call for consolidation. We [siloviki] must understand that we are one whole. History ruled that the weight of supporting the Russian state should fall on our shoulders. I believe in our ability, when we feel danger, to put aside everything petty and to remain faithful to our oath. Sergei Grigoryants, who has often been interrogated and twice imprisoned (for anti-Soviet propaganda) by the KGB, says the security chiefs believe “that they are the only ones who have the real picture and understanding of the world.” At the centre of this picture is an exaggerated sense of the enemy, which justifies their very existence: without enemies, what are they for? “They believe they can see enemies where ordinary people can’t,” says Ms Kryshtanovskaya. From this perspective, anyone who plays into the West’s hands at home is the internal enemy. In this category are the last free-thinking journalists, the last NGOs sponsored by the West and the few liberal politicians who still share Western values. 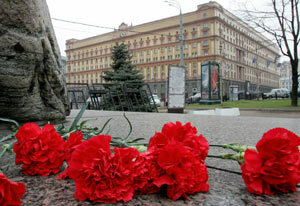 To sense the depth of these feelings, consider the response of one FSB officer to the killing of Anna Politkovskaya, a journalist whose books criticising Mr Putin and his brutal war in Chechnya are better known outside than inside Russia. “I don’t know who killed her, but her articles were beneficial to the Western press. She deserved what she got.” And so, by this token, did Litvinenko, the ex-KGB officer poisoned by polonium in London last year. In such a climate, the idea that Russia’s security services are entitled to deal ruthlessly with enemies of the state, wherever they may be, has gained wide acceptance and is supported by a new set of laws. One, aimed at “extremism”, gives the FSB and other agencies ample scope to pursue anyone who acts or speaks against the Kremlin. It has already been invoked against independent analysts and journalists. A lawyer who complained to the Constitutional Court about the FSB’s illegal tapping of his client’s telephone has been accused of disclosing state secrets. Several scientists who collaborated with foreign firms are in jail for treason. Despite their loyalty to old Soviet roots, today’s security bosses differ from their predecessors. They do not want a return to communist ideology or an end to capitalism, whose fruits they enjoy. They have none of the asceticism of their forebears. Nor do they relish mass repression: in a country where fear runs deep, attacking selected individuals does the job. But the concentration of such power and money in the hands of the security services does not bode well for Russia. The creation of enemies may smooth over clan disagreements and fuel nationalism, but it does not make the country more secure or prosperous. While the FSB reports on the ever-rising numbers of foreign spies, accuses scientists of treason and hails its “brotherhood”, Russia remains one of the most criminalised, corrupt and bureaucratic countries in the world. During the crisis at a school in Beslan in 2004, the FSB was good at harassing journalists trying to find out the truth. But it could not even cordon off the school in which the hostages were held. Under the governorship of an ex-FSB colleague of Mr Putin, Ingushetia, the republic that borders Chechnya, has descended into a new theatre of war. The army is plagued by crime and bullying. Private businessmen are regularly hassled by law-enforcement agencies. Russia’s foreign policy has turned out to be self-fulfilling: by perpetually denouncing enemies on every front, it has helped to turn many countries from potential friends into nervous adversaries. Tagged energy, geopolitics, policy, political economy, russia, war. Bookmark the permalink.